Thank you to the Stubbings family for your generous donation and commitment to CMHA Thunder Bay! 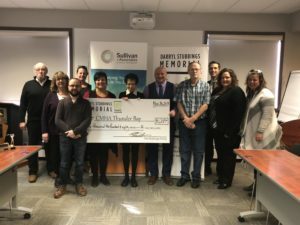 Today, CMHA Thunder Bay announced the final proceeds raised from the Darryl Stubbings Memorial Golf Tournament held this September in support of our education and training initiatives. The family organized the tournament in memory of Darryl “Stubbs” Stubbings who died by suicide at age 32 in September 2011. Family and friends remember Darryl as a kindred spirit who had a profound impact on those who knew him. Darryl did not just love things, he was intensely passionate about them – his family and friends, music, cooking, golf and the Toronto Maple Leafs. Sadly, Darryl’s story ended too soon. The Stubbings family are committed to encouraging open conversations about suicide and to raise awareness in the hopes of preventing others from suffering the same fate. On behalf of CMHA Thunder Bay, a generous thank you goes out to Tiffany and family, the golfers, volunteers, and sponsors for this amazing contribution.